THE PRESIDENT: Good morning, and welcome to the White House. Laura and I are honored to join you on this important occasion. The St. Olaf Choir, led by Anton Armstrong, performs during the commemoration of the National Day of Prayer commemoration in the East Room Thursday, May 5, 2005. White House photo by Eric Draper Laura and I are proud Methodists and we're pleased to be here with Bishop Peter Weaver, who is the president of the Council of Methodist Bishops, who will deliver the closing prayer. Thank you. The National Day of Prayer is an annual event established in 1952 by an Act of the United States Congress. Yet, this day is part of a broader tradition that reaches back to the beginnings of America. From the landing of the pilgrims at Plymouth Rock, to the launch of the American Revolution, the men and women who founded this nation in freedom relied on prayer to protect and preserve it. Today, prayer continues to play an important part in the personal lives of many Americans. Every day, millions of us turn to the Almighty in reverence and humility. Every day, our churches and synagogues and mosques and temples are filled with men and women who pray to our Maker. And almost every day, I am given a special reminder of this great generosity of spirit when someone comes up and says, Mr. President, I'm praying for you. Prayer has been an important part of American public life, as well. Many of our forefathers came to these shores seeking the freedom to worship. 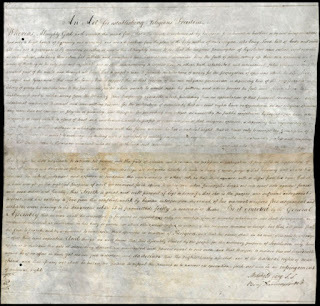 The first Continental Congress began by asking the Almighty for the wisdom that would enable them to settle things on the best and surest foundation. And when our Founders provided that sure foundation in the Declaration of Independence, they declared it a self-evident truth that our right to liberty comes from God. And so we pray as a nation for three main reasons. We pray to give thanks for our freedom. 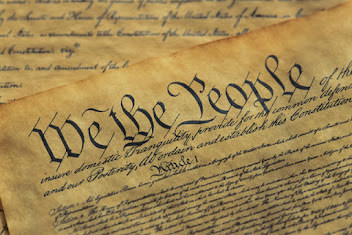 Freedom is our birthright because the Creator wrote it into our common human nature. No government can ever take a gift from God away. And in our great country, among the freedoms we celebrate is the freedom to pray as you wish, or not at all. And when we offer thanks to our Creator for the gift of freedom, we acknowledge that it was meant for all men and women, and for all times. 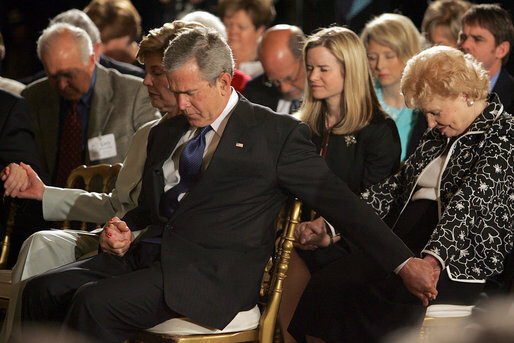 President George W. Bush and Laura Bush holds hands with guests while praying during a ceremony observing the National Day of Prayer in the East Room Thursday, May 5, 2005. White House photo by Krisanne Johnson Second, we pray for help in defending the gift of freedom from those who seek to destroy it. Washington prayed at Valley Forge. Franklin Roosevelt sent American troops off to liberate a continent with his D-Day prayer. Today, we pray for the troops who are defending our freedom against determined enemies around the globe. We seek God's blessing for the families they have left behind, and we commit to Heaven's care those brave men and women he has called home. THE PRESIDENT: Finally, we pray to acknowledge our dependence on the Almighty. Prayerful people understand the limits of human strength. We recognize that our plans are not always God's plans. Yet, we know that a God who created us for freedom is not indifferent to injustice or cruelty or evil. So we ask that our hearts may be aligned with His, and that we may be given the strength to do what is right and help those in need. We who ask for God's help for ourselves, have a particular obligation to care for the least of our brothers and sisters within our midst. During the funeral for Abraham Lincoln, Bishop Matthew Simpson relayed a story about a minister who told our 16th President that he hoped the Lord was on his side. Lincoln wisely replied that he was more concerned that he was on the side of the Lord, because the Lord was always on the side of right. Freedom is a divine gift that carries with it a tremendous human responsibility. The National Day of Prayer is a day that we ask that our nation, our leaders and our people use the freedom we have been given wisely. And so we pray as Americans have always prayed: with confidence in God's purpose, with hope for the future, and with the humility to ask God's help to do what is right.